NIIGHTS shift seamlessly between dream-pop and heavier melodic rock with shimmery, fuzzy layers of texture. Ethereal female vocals whisper poignant and whimsical lyrics, paired with artfully crafted dynamic songwriting to channel the spirit of 90’s shoegaze and early Smashing Pumpkins with an enchantingly fresh spin. Fronting NIIGHTS is visual artist & singer-songwriter Jenna Fournier, a Las Vegas-to-Cleveland transplant who began working with songwriter and innovative guitarist/pedal-tweaker Frankie Maraldo in 2010. The two are now joined by Jeremy Dodge on drums and bassist/synthesist Jacob Chandler, who anchor and underline the sonic chaos. 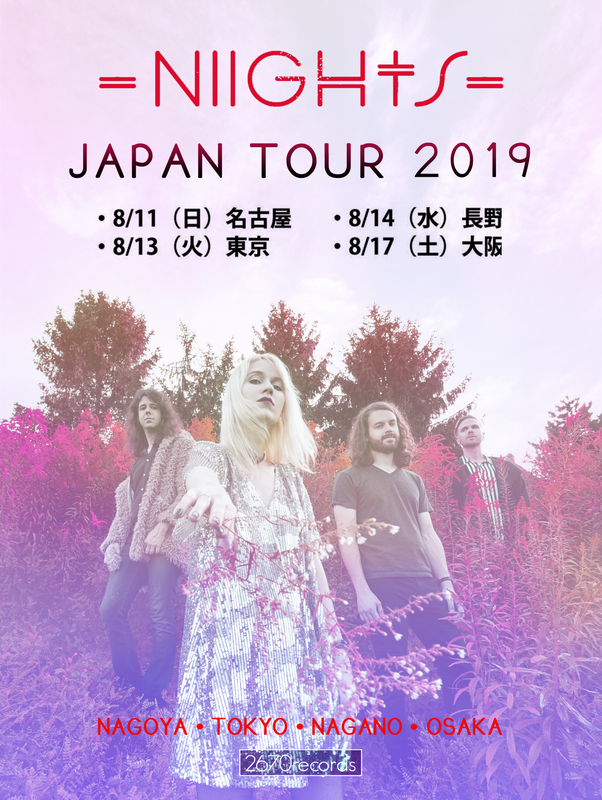 NIIGHTS released their first EP, A Tangle of Arms, in 2010, followed by their debut album Whisper (recorded by Jim Stewart) in 2013, which landed them a deal with 2670 Records in Japan. After two international tours, NIIGHTS signed with Tragic Hero Records and re-mixed Whisper with legendary producer Jim Wirt for a re-release in 2015. Fournier soon returned to Japan with an exclusive solo EP in 2017, simultaneously recording a new NIIGHTS album with Maraldo and Wirt while struggling over the loss of two bandmates. Despite setbacks, NIIGHTS pushed forward, obsessing over details in the studio to complete their latest full-length album, Hellebores. The album, which hit the shelves February 15th, 2019, is packaged physically as one full LP, but released digitally in two halves, a lighter side and a darker side, both which channel the band’s influences from 90s shoegaze and dream-pop with a fresh spin on the genres. The release quickly garnered attention from national press, including Stereogum and Fader, with a DIY music video that the band filmed with a VHS camcorder for their single “So Into You.” Hellebores also climbed immediately to Disc One in Pop-Rock in Tower Records all over Japan. NIIGHTS has followed up their sophomore release with an early Spring US tour with one of bedroom-pop’s cult-favorite artists, Elvis Depressedly, and returns for a fourth tour to Japan in August of 2019.